Lids, originally uploaded by sylviecoladolls. Well, I’m back from IFDC and all those pressing projects and commissions are finally out of the way,(except for Iveta’s…haven’t forgot about you my dear ;-)). I feel like I can breathe again and decided I will accept commissions again on a very limited basis. I’ve decided I’ll accept two a month and already it looks like August and September are booked so I have 4 more openings for the rest of the year. This means that if you send a doll for me to do during your month it will be completed the same month. I was falling so far behind that that wasn’t always the case. This will be for face-ups only. I may accept 1 or 2 re-root commissions here and there but it will be a longer wait from when the doll is received. I’m taking the rest of July off and will work on projects here and there. Perhaps paint my family room and bathroom. Also I want to get back into other forms of creative expression. So maybe I’ll do some artwork. Wherever the wind takes me I suppose. Now, I briefly mentioned my friend Iveta. She also goes by the title “dolly pimp.” Well, her photography is featured on a clothing line website. Congrats Iveta! 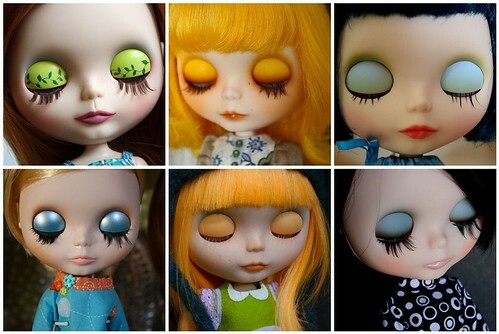 This entry was posted on July 16, 2010 at 5:12 pm and is filed under blythe, Custom Dollies, Dolls. You can subscribe via RSS 2.0 feed to this post's comments.